Introducing our new 2 gram Nitrogen Chargers. 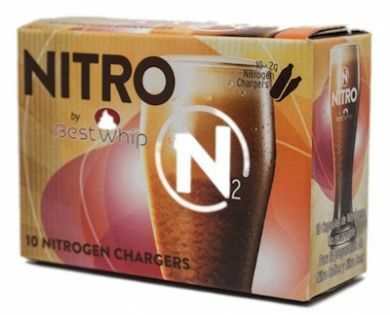 These Nitrogen (N2) chargers make preparing Nitro Coffee and Nitro Beer fast and easy. Please note they will not whip cream. Nitro coffee is said to have originated in Stumptown, Portland and quickly became popular across America. Nitrogen Cold Brew Coffee (or NCB) is coffee charged with nitrogen to give it a sweeter, creamier and richer texture with a head similar to Guinness. The nitrogen reduces the acid taste of the cold brew coffee making it more palatable. Nitrogen restricts the amount of oxygen in the coffee which slows down the rate of oxidation which makes coffee sour and bitter the longer it sits. Therefore because nitro coffee retains its fresh flavour it can be prepared in advance before serving it or adding it to other drinks and dishes. How to make Nitro Coffee. Dispense into cup or glass. The fast jet of dispensing 'whips' the nitrogen into the coffee. How to make Nitro Beer. Dispense into cup or glass. The fast jet of dispensing 'whips' the nitrogen into the beer. Nitro for pressurising or preserving beer and wine. Our nitrogen cartridges can be used in place of 8g Co2 cartridges to pressurise and preserve homebrew beer kegs or wine. Our nitrogen cartridges are ideal for making infused cocktails. Use with our Soda Splash carbonator/infuser or stainless steel cream whipper to make incredible infusions such as Sloe or Damsin gin! The nitrogen pressurises the Soda Splash flask and forces liquid into aromatics. When the flask is depressurised the liquid is pulled back out of the aromatic, dragging the flavour with it! Try spices, herbs, vanilla or citrus peel in a spirit or wine to create an instant infusion! Some suggestions include herb infused red wine, dill infused vodka, cinnamon infused brandy, raspberry & basil infused vodka and coffee infused whisky. NOTE: The cartridges will NOT whip cream. To whip cream please use our Best Whip or ISI N2O Cream Chargers.